This noodle soup is delicious and easy to make and modify for whatever vegetables or protein that you have in your kitchen. It can be made spicy or mild, chunky or smooth, vegetarian or in a meat-lover's version. Bring broth up to a boil. Add garlic and ginger to the broth and reduce to simmer. Add mushrooms and pepper and cook over low heat for 10 minutes. Drain noodles and toss with sesame oil. Coarsely chop green tops of green onions. Add noodles and scallions to broth. To serve soup, divide between 4 serving bowls. The oldest noodles have been eaten and enjoyed in Asia for over 4,000 years, but the modern wheat-based noodles did not reach Asia until around AD100. These wheat noodles quickly spread from China to other Asian countries like Korea. 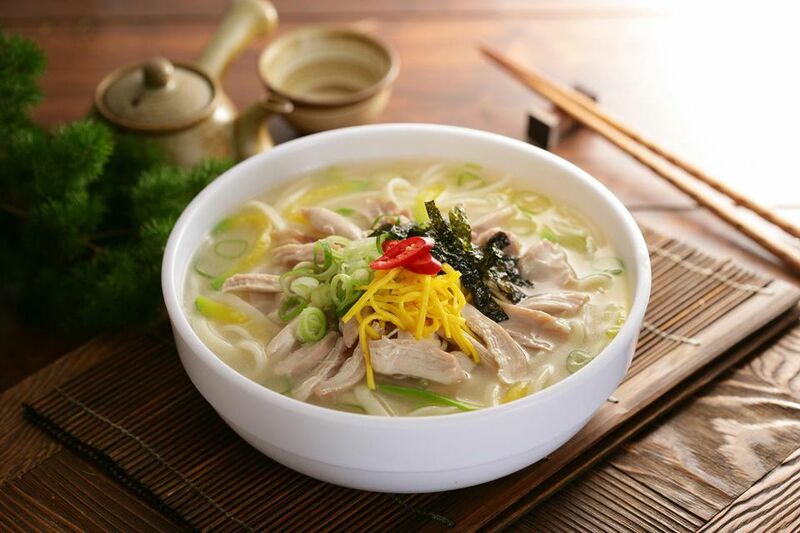 In Korea, noodles symbolize longevity because of their long and continuous form. That is why they are served at wedding celebrations and important Korean birthdays. Korean noodles are called “gooksu” in Korean or “myun” in hanja (Chinese characters borrowed and used in the Korean language with Korean pronunciation). Although noodles have been part of Korean cuisine since ancient times, wheat was expensive so noodles weren't eaten or enjoyed every day or every week until the 1940s. Ginger is native to Asia where has been used as a cooking spice and as medicine for thousands of years. It is used to make medicinal and herbal teas, to increase the temperature in the body and also to increase the body's metabolic rate. The part of the plant that we use is not the root, but the underground stem, or rhizome. Ginger contains many health benefiting essential oils such as gingerol and zingerone. Gingerols help improve the intestinal motility and have anti-inflammatory, painkiller (analgesic) and anti-bacterial properties. Ginger has been used to aid digestion and treat stomach problems, gas, diarrhea and nausea for more than 2,000 years. More recently, it has demonstrated some effectiveness in preventing motion sickness. It has also been used to treat the common cold, stomach ulcers, headaches, menstrual cramps, migraines, arthritis, and colic. Ginger is low in calories and contains no cholesterol, and is a rich source of many essential nutrients and vitamins such as pyridoxine (vitamin B-6) and pantothenic acid (vitamin B-5). It also contains a good amount of minerals like potassium, manganese, copper, and magnesium.